I recently found some time to think about it again. Here is a prototype I made: https://youtu.be/v-XJv–BX4Y It is a bit too slow to be mounted on a boat yet. But I think I am going to make a new one with some nema 17 motors. I have to say that I don’t know much about antennas or all the technical stuff around it. So your opinion about it and if you think this concept could work would be highly appreciated. Can I stack a dreamcatcher on top of the existing board? And will the motors or any of the electronics interfere with the antenna? @Syed can you already tell us the dimensions of the new product and when it will be available? And do you think I can mount the whole thing on an device based on this to point it to the closest satellite? And how are the chances I can use this to recieve actual grib files on my boat here in europe this year? Maybe when there would be a cheap antenna for boats and the possibility to get free weather forecasts it could be possible to get some help with the funding. e.g. the two big german boating associations pay a contribution in order for all pleasure craft to use the locks on the waterways for free. That is slick! My biggest concern–and it’s a huge one–about maritime usage is that the PCB is not designed/manufactured to withstand a saltwater environment. I don’t think our product will last very long on the sea. But that aside, the only major thing to consider is skew adjustment. Skew will change as the boat is in motion and that is definitely a reception/pointing parameter. The dimensions are roughly 8" x 8"; it’s a dome. I would not think there would be any EMI from the motors that would interfere with reception. And do you think I can mount the whole thing on an device based on this to point it to the closest satellite? And how are the chances I can use this to recieve actual grib files on my boat here in europe this year? Very good; currently working on this. Thanks a lot! And sorry, I am not that good in english ;-). I meant I would like to make a base for the new hardware that would point the whole thing in direction of the closest satellite. So actually a bigger version of this one which holds the new product instead of the LNB. But when you say it is a dome, does it mean, I will still have to point it towards a satellite or will it have some sort of omni-directional antenna inside? (just guessing by the dome shape). And the skew adjustment should be easy to compensate by adding another stepper to turn the LNB. I will include one in my next design. What i was still concerned about is the accuracy of the alignment. Do I have a margin of some degrees around all axes? As to the water resistance. I’m planning to put a dome over the whole setting. As a first quick solution he lower ring on the device is supposed to hold the lit of a small bucket facing upward to put the bucket just on top of everything. But it should be possible to find a better solution for a weather-proof enclosure in later versions. Maybe not directly related, but something you would find interesting is the manual pointing assembly that @Tysonpower designed. Here’s is the thread. The dome will not include an omni directional antenna. It will enclose an assembly that allows for manual pointing. I think you might be able to insert your motors into the enclosure. It’s just a hemisphere with ~20 cm diameter. There is significant margin for error with the LNB. The horn on the LNB is the antenna, which has 13 dBi of gain and over 30-degrees of -3 dB beam width. Probably the most sensitive axis is skew, but even that can be eyeballed. But it should be possible to find a better solution for a weather-proof enclosure in later versions. Thanks again for your answers. That sounds pretty encouraging. I will get me a Dreamcatcher as soon as the signal will be available in Europe and try my luck with an improved design. I think this will be easier than adding some motors to the new product. Oh sorry i forgot to ask: Is there a template available for the board? Like a file to print out to give me the dimensions and the positions of the mounting holes? Sure thing. I’ll email you the .dxf. Syed, I’ve been VERY interested in your project and wish we were still able to use the original antenna that just needed to point close to the right direction. Martin’s tracker looks AWESOME and it can certainly be marinized. I’m in the sailing and cruising community and can tell you that there are MANY of us that were using your system before the change. Whatever I can do to help, I’ll do. I wonder if offering a subscription service could offset the cost to broadcast over the original system? I believe you would have many takers. @Brad_Scott The previous L-band network was exceptionally expensive to operate and provided incredibly low bitrates. It seems that your main interest is just ease of pointing. Is that right? If so, it makes far more sense to develop an auto-acquisition system than go backwards to L-band. A subscription service for a dedicated, higher bandwidth weather data service is something we have considered, but the building marine-grade products is not cheap and we really need to have channel partners to enter that market. Do you have any personal contacts to organizations that would be interested in selling this service to customers that they already have? I totally agree with @Brad_Scott that lots of sailors would be interested in Othernet. This is also the reason which brought me here. May I asked where you are based Brad? @Syed But the footprint of the satellite (SES 4) looks like the signal will only be available close to land and that the canary islands for example are already on its edge. Would it be possible to cover the areas for ocean crossings one day, where a weather update would be needed most? I mean if there would be enough demand? And Syed, do you know how long the shipping of a dreamcatcher to Europe would take and how much it would be? And are you already planning any sales in the shop again like the one I missed recently ;-)? I don’t have much time at the moment, but I am still working on my project and I will try to take it with me when I will be back on the boat at the end of march to test it. I added a new axis for the skew now as well as a mount for the dreamcatcher (a cardboard template so far). This week it will get its water proof housing. I kept the smaller motors because I think I will be able to still increase its speed by changing the code. And I already have azimut and elevation set for SES 4. I don’t disagree that sailors would be interested. My point of concern is the type of product that needs to be developed in order to satisfy that market. You are right: SES-4 is focused on terrestrial coverage. We can always and very easily add coverage that would be focused on maritime areas, but there really needs to be a business case first. That’s why alignment with an organization that already understands the market makes the most sense. Shipping to customers in Europe generally takes 10 days. Generally. No plans on a sale real soon–but you never know! Are there already news about the start of the signal in Europe? And just as an idea, is there a possibility to comunicate with the Dreamcatcher via serial or i2c to read the current strength of the signal? That could help to find the best position for the antenna without dealing with declination for the compass reading. Thank you very much! The setup is running on 5 V from a small porwerbank. And I measured 0,5 A during operation using a USB monitor. The elecronic parts are around 24 € + the board + wires + 3D printed parts + any bucket with a lit as the enclosure. So I guess the whole thing would be around 30 - 40 €. A 360 or a course change would not require any user intervention. The unit can spin around more than 360° without messing with any wires, so I could even drive in circles. But a radical course change would interrupt the signal I guess when the motors are too slow to return to the correct azimut fast enough. But it will return on its own. I want to use the feedback from the Dreamcatcher mainly to vary all axes a bit around the pre-programmed positions to check if that would result in a better signal and then reset it to the direction with the best results. Because the boat will move around to areas with a different magnetic declination and steer different courses which will change the magnetic deviation. Those factors will cause errors in the compass reading. I could try to calculate those errors by tables in the code, but I hope I can just point it in the general direction and then try to find the best signal somewhere around there. So there wouldn’t be any need to do manual corrections. How do you deal with the coax connected to the LNBF? It appears to me that you have a great mechanical load to overcome that isn’t yet seen or addressed in your video. Great project, keep up the good work! Thank you very much Jerry! You are completely right about that. This will still be a big issue to solve. I thought about using a longer cable and running it in big loops towards the Dreamcatcher. That should give me some more flexibility. But I’ll have to wait for that until I can add a Dreamcatcher to my setup. the motors are too slow to return to the correct azimut fast enough. 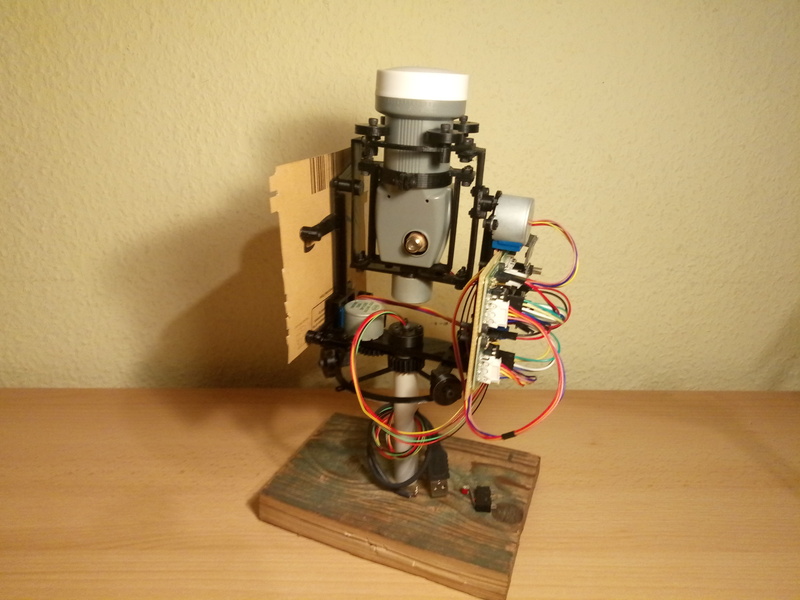 Well done…Fantastic motorized Antenna Housing. It will be amazing for when you are anchored. I think using it underway will be tricky. Do we know what error correction Othernet is using? My feeling is that without Gyroscopic stabilization you will have too many errors. Thank you very much seasalt. I hope I can do without using gyros. I have to admit I don’t know too much about antennas and error correction. I will try to test it under way when the signal will be available and hope it willl do just fine. If not I’ll have to find the cause and think about an alternation of the design. But using old computer hard drives as gyros sounds interesting. I will keep this in mind. This week, I ran some tests North of Cuba in the Caribbean that provided reliable reception on the edge of SES-2’s coverage on a 126,000 ton ship. We were in 2 meter seas on a straight course. While both SES-2 and the forthcoming SES-4 (22 deg West) service do not cover the Atlantic, SES-4 will provide good coverage in the Mediterranean and Black Seas as well as along the Norwegian coast and around the UK. It will be interesting to find out how Othernet’s Ku-band service works on large tankers and container ships in different sea state. 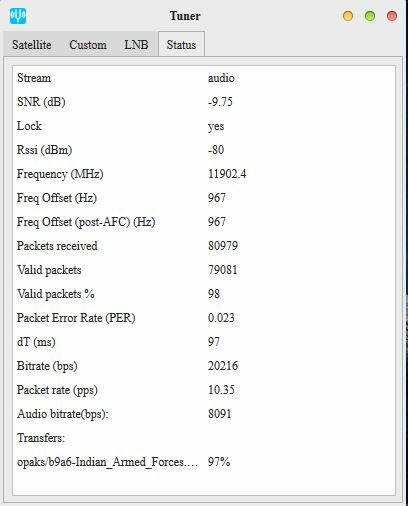 In my tests, I operated with an SNR of -9.75 dB, Rssi of -80dBm, bit rate of 20216 bps, and valid packets over 98 %. Audio worked fine. I could hold up the link for long tracks until the ship changed course by more than 30 degrees for periods of time between 4 and 6 hours. Setting azimuth was easy using the true azimuth based on the ship’s course bearing. 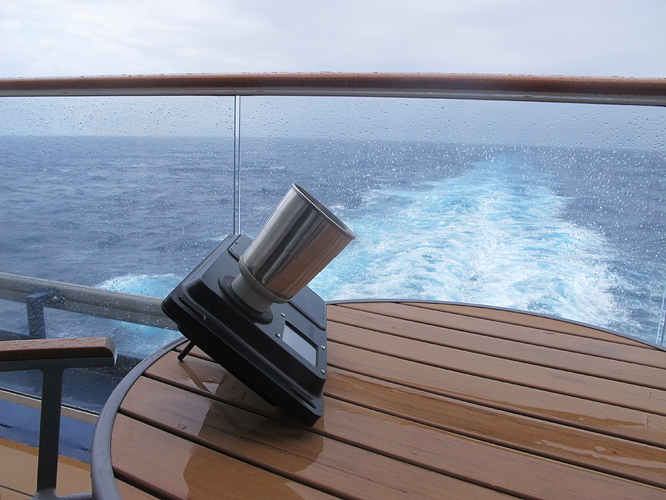 A course of 300 deg meant left (port side) faced 210 deg, right side (starboard) faced 30 deg, and stern faced 120 deg. That made it very easy to point to SES-2 at 220 deg.